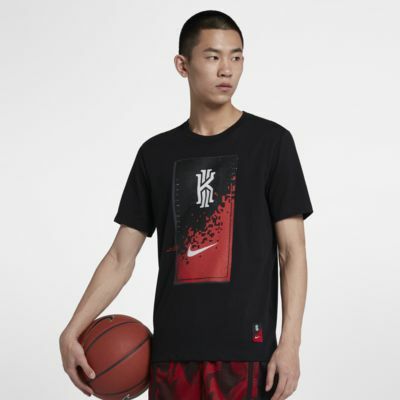 The Nike Dri-FIT Kyrie T-Shirt shows off modern basketball style through the lens of our favourite point guard, Kyrie Irving. It's made from soft, sweat-wicking fabric for all-day comfort. The Nike Dri-FIT Kyrie T-Shirt shows off modern basketball style through the lens of our favourite point guard, Kyrie Irving. It&apos;s made from soft, sweat-wicking fabric for all-day comfort. Lightweight fabric offers a soft, comfortable feel. Kyrie-inspired graphic is printed on the front. Have your say. Be the first to review the Nike Dri-FIT Kyrie.